Earlier this year, I reviewed another book by Matt Rota called The Art of Ballpoint. If you have that book, it's great because you don't need this book. 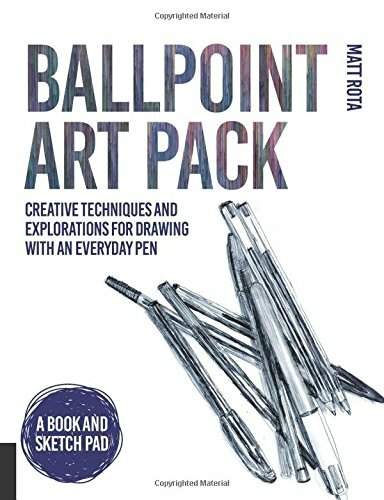 Ballpoint Art Pack is a condensed edition that collects the drawing exercises from the earlier book. What's missing are the artists highlights which I felt were insightful. The paperback book itself is smaller and has 112 pages vs 160. Since this is a pack, a sketch pad is also included. Paper quality of the sketch pad is quite good. It's those tear and throw type of sketchpad. In short, you get more content with The Art of Ballpoint. That's the book I'll recommend because you can always buy yourself a separate sketch pad. However, Ballpoint Art Pack does feel like a good gift to buy for someone. If you like pen and ink, be sure to check out Pen & Ink: Contemporary Artists, Timeless Techniques by James Hobbs too.